Because conditions such as Alzheimer’s and Parkinson’s are relatively common in the elderly, it’s important to understand how they can affect a senior’s health. However, learning about some uncommon conditions can also be helpful in keeping your elderly loved one healthy. 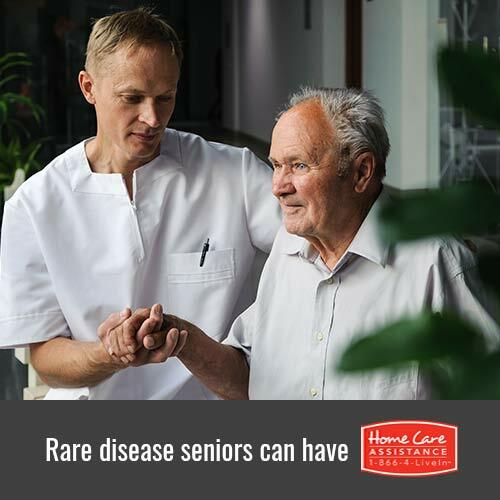 The staff at Home Care Assistance, a leading provider of in-home care in Harrisburg, has put together a list of rare diseases your loved one may be at risk for. This rare degenerative neurological disease can develop in a senior around the age of 60. MSA is referred to as a Parkinsonian-type disease due to similar side effects such as tremors and impaired posture. Treating MSA generally includes medication to regulate blood pressure. Unfortunately, there is no cure for MSA, but the symptoms can be managed when this condition is caught early. This is another degenerative brain disorder that is almost exclusively diagnosed in seniors. Lewy bodies are microscopic inclusions that slowly break down nerve cell walls, which results in dementia-like symptoms. LBD cannot be prevented, but the symptoms can be managed if an early diagnosis is made and a Harrisburg dementia caregiver is brought into the home to help. DISH is an unusual medical condition that causes bone spurs to develop along joints and the spine. Over time, this can result in side effects similar to arthritis. Seniors who have DISH often experience difficulty moving, problems with their posture, and aching pain along their hips and spine. This condition tends to affect seniors with other skeletal issues at a much higher rate, which is why many doctors suggest osteoporosis or arthritis medication to treat DISH or prevent it outright. The initial stage of amyloidosis, which often involves weight fluctuations, joint pain, and unusual changes to the skin, is currently untreatable. However, when amyloidosis is caught early enough, the second stage can often be prevented. This includes managing other conditions that worsen the amyloidosis, such as arthritis and bone infections. The second stage of amyloidosis almost always results in more severe medical complications like organ failure. At Home Care Assistance, our caregivers provide a safe and comfortable environment for seniors with a wide variety of health conditions. Our hourly and live-in care services include assistance with mobility and exercise, cognitive stimulation, medication reminders, transportation to medical appointments, and much more. We also offer specialized post-stroke, Alzheimer’s, and Parkinson’s care Harrisburg families trust. For more information and to schedule your free in-home consultation, call one of our knowledgeable Care Managers today at (717) 540-4663. Are Mammograms More Harmful Than Beneficial?